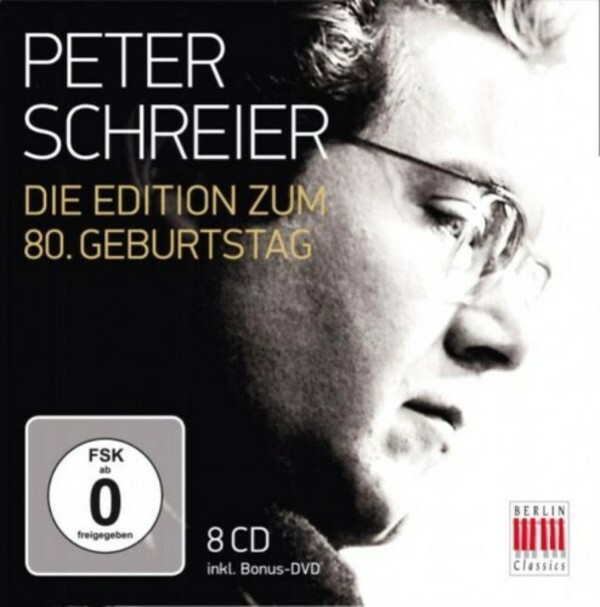 On July 29 this year, Peter Schreier celebrates his 80th birthday – an opportunity for the Berlin Classics label to honour the legendary singer with a generous box set. What concepts do we most readily associate with this outstanding musician? Being himself mattered to Peter Schreier, and he also liked to be easily understood. His pronunciation was always clear, but in addition to that, he sang the lyrics so as to make sense of them. Without ever sounding affected, he could bring out the inner meaning of a Schubert song as effectively as when he sang the part of a Bach Evangelist. In this sense, he was an unchallenged authority who was never dependent on pretentious gestures. This is surely one reason why he was so popular beyond the classical-music scene. The music on these eight CDs has been selected from the extensive Eterna archive in close consultation with Peter Schreier. It covers all the essential aspects of his repertoire, all the fields in which he laid down benchmark interpretations as a singer. The set includes a recording of Schubert lieder that is receiving its very first release on CD. The included DVD features a recent half hour interview with the singer, in which he looks back on a rich artistic life. Film excerpts of a 1971 lieder recital with Rudolf Buchbinder round off the DVD and the complete set – which will delight fans of the tenor and those keen to discover his many facets! 15. So ist das? So? – Ja, mein Coce!